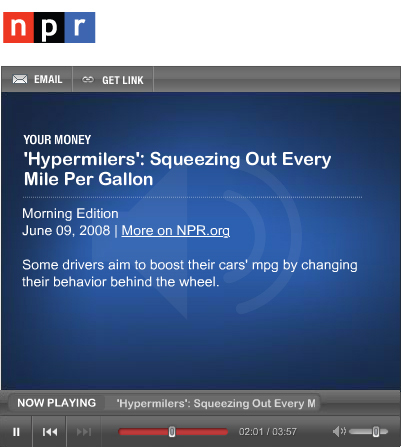 Today, NPR had an interesting story about “Hypermilers”, a group of people who try and get every last bit of distance out of each gallon of gas they use in their cars. In an ideal world, record high gas prices and the threat of global warming would inspire large scale systemic change where automobile companies produce ultra high efficiency cars, cities curb sprawl while fostering high-density mixed-use development, and where investment in mass transit is a top priority. However, we don’t live in an ideal world. So, in the absence of that kind of change people can take it upon themselves, like these Hypermilers, to protect their wallet and the environment by changing the way they drive. What the Hypermilers are doing is a part of “EcoDriving“, a way of driving that decreases the amount of fuel you use and the quantity of greenhouse gas emissions that you emit. It’s not a substitute for deeper, big picture solutions that get to the root of these problems, but in the meantime, it sure can help.